Lawrence M. Kryske, Churchill Without Blood, Sweat, or Tears: Applying His Methods for Today’s Leaders. Plano, Texas: Homeport Publishing, 2018, paperback, $15.99. Author Kryske, a former United States naval commander, is a lifetime student of Churchill. He is a notable exponent of Churchill’s leadership methods through his work as a seminar conductor, professional speaker, and education administrator. Kryske considers Churchill a “twentieth-century Renaissance man” (13) whose repeated triumphs over adversity offer enduring leadership lessons. His book provides a road map to leadership success with practical strategies he describes as “applied Churchill” (14). It avoids being bogged down in biographical details. This book might be read in conjunction with previous books on the same theme: Kryske’s The Churchill Factors: Creating Your Finest Hour (2000) and the now classic Churchill on Leadership: Executive Success in the Face of Adversity (1997) by Stephen F. Hayward. In the preface, Admiral Curtis Kemp observes that Churchill epitomizes great leaders who create momentum to overcome bureaucratic inertia “with grit—a combination of passion plus resilience.” This is a nice set up for Kryske’s interpretation of Churchill’s formula for success via the “Churchill Factors” of vision, courage and determination. These qualities shone in all his great endeavors, from writing a book to giving a speech, from painting a picture to modernizing the pre-World War I Royal Navy. 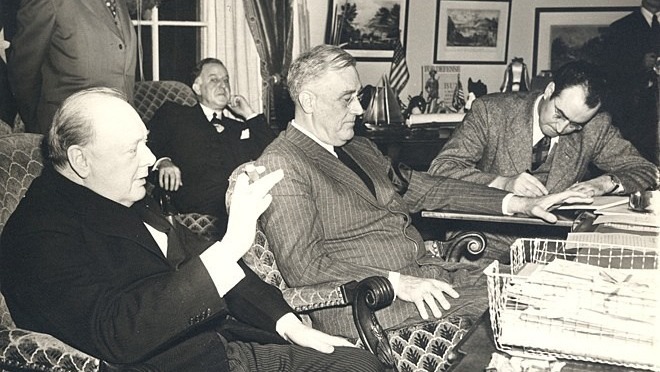 They were evident too in Churchill’s warning the world of fascism and communism, and his collaboration with allies like Roosevelt in World War II. Kryske cleverly illustrates his Churchill Factors throughout the text with fifty-two boxed Churchill quotations without citation, but apparently from Richard Langworth’s Churchill by Himself. I checked about a dozen against the latter and they were correctly quoted. Kryske selects such gems as “You must look at the facts, because they look at you” (38) and “This truth is incontrovertible. Panic may resent it, ignorance may deride it, malice may distort it, but there it is” (62). Another brilliant touch are thirty-six boxes reading ACTION THIS DAY, in the reddish-orange color of the famous tags Churchill attached to wartime memoranda. These highlight Kryske’s summary bullet points. 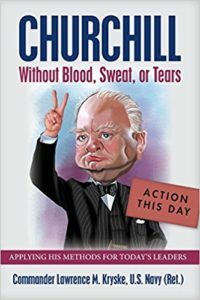 Kryske’s Churchill Factors of vision, courage, and determination have several sub-factors, which he reviews in great detail. There are three elements of vision, he explains. These are “discernment, passion, and innovation.” The two elements of courage are “clarity of purpose and action.” Determination’s sub-elements are “motivation and resilience.” Kryske offers additional sub-factors, not all of which need be reviewed here. But for example, he writes that “discernment” must itself be based on logic, intuition, and knowledge, guided by a sense of priorities and focus—the big picture and the details, the historical perspective and simplification. For this last, Churchill was a practitioner of “Occam’s Razor,” the problem solving principle that the best solution to any problem is the one with the fewest assumptions. Lawrence Kryske has written a tour de force on Churchill leadership techniques, explored inside and out and accessible for ready application. Churchill’s inspiration is evident throughout his book, as is his humor. Kryske observes that Churchill’s writings were based often on dictating up to 5000 words a day, making him “the greatest dictator of all time” (57). Kryske ends his leadership lesson for us with a pithy quote of his own: “Lead boldly and live victoriously” (146). Affordably priced, Churchill Without Blood, Sweat, or Tears includes a select bibliography, but no index, end notes, or illustrations. In addition to being read along with Stephen Hayward, it might also go well with Lewis Lehrman’s magisterial Lincoln and Churchill: Statesmen at War (2018). Mr. Shepherd is Acting University Archivist of The Catholic University of America, and is the creator and principal writer for The Archivist’s Nook. He is also a frequent contributor to America’s Civil War and Military History magazines.